It seems Google is pretty serious about its newly-released Audiobook collection. So serious, in fact, that they are unleashing their second substantial promotion for the service within just weeks of launch. The first time around, Google gave everyone a 50% deal on their first audiobook purchase. This time, at least for Google Home owners, they are significantly upping the ante. I personally took full advantage of Google’s first offer and snagged a new audiobook for half off when the original promotion was available. This time around, Google is offering what amounts to a no-brainer deal. 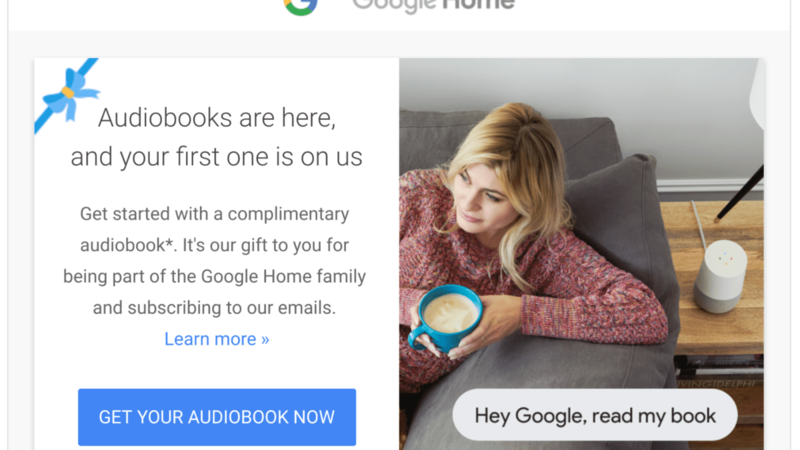 If you own a Google Home and have opted in for promotional emails, you should be seeing this latest offer in your inbox. And, if you like audiobooks even a little, there’s literally no reason not to take advantage of this offer. There’s no catch here, but there are a few things I mentioned up there you need to keep in mind. First, you need to have opted-in to promotional emails before this offer went out. If you are not and don’t want to miss out on further deals, head over to https://store.google.com/account, sign in, and scroll to the bottom. You’ll see a checkbox where you can opt-in for news and updates. As long as you had this in place prior, you should see the email. If not, it is unclear whether or not correcting this in your account will score you an email or not. I would be inclined to think not. Remember, this deal is via the email from the Google Store only. There’s nowhere to go to take advantage if you don’t have the email to start from. Second, you need to own a Google Home product. A Google account or device with Assistant isn’t enough here. 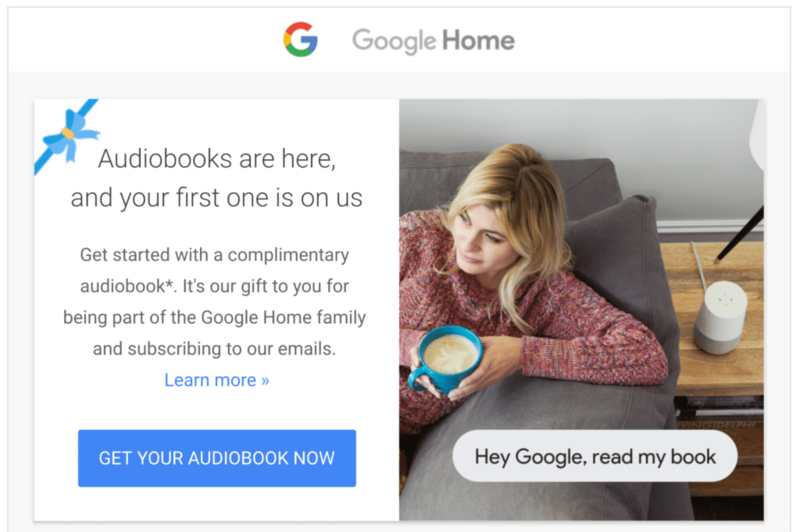 You need to have purchased a Google Home, Home Mini, or Home Max to expect the arrival of this promo email. With one of the big features of Google’s new audiobook offering being the integration with Google Home speakers, this caveat makes sense. Not only is Google tapping into a new content market, they are also making sure everyone knows that there is full integration with the Google Assistant and that Audiobooks – at least from Google’s perspective – are meant to be consumed with your favorite smart speaker. For me, the car has always been my go-to spot for audiobooks when I listen to them. I do suppose, however, that plenty of books could be consumed right at home over the speakers of a Google Home, Home Mini, or Home Max as well. Either way, if you have one of these devices and even think you might be interested in listening to a book at some point, you should take advantage of this one!